I may or may not be running a 5K costume run this weekend. I am still undecided; however, I have a race outfit costume picked out. That is the most important part, right? Ahoy mates! Surrender yer booty! I really wanted a red pirate tank top, but they are hard to come by. I did several Google searches that yielded nothing. This tank from Café Press was the best I could find. It wasn't too expensive because I found a promo code that got me 20% off. I was going to go with a red skirt sparkle skirt, however, I broke the needle on my sewing machine and I am too cheap lazy to go buy another one. At least the black sparkle skirt goes with the white tank top. I still think that a red skirt would look even better. Oh well. 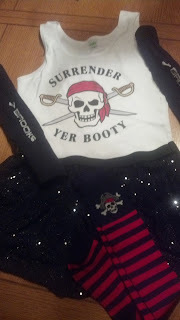 Every race costume is made perfect by a Team Sparkle skirt so it is a win win. I thought that the socks were pretty neat. They were what sparked my enthusiasm in being a pirate. I got them at Fred Meyer for a couple of $$$. The best part about the socks is that they were made to look tattered on the top- very pirate like. Money well spent. I still need to find an eye patch and a bandana. My mom suggested I skip out on the eye patch because I have a reputation for running into things when I am not paying attention. Like the time I was running and ran into a brick lamp post and jammed my finger....that was awesome. Have you ever run in a costume themed race before? If so, what was your costume??? What is the best costume you ever seen participate in a race?